For all your mystical and magical needs, we are proud to offer a fantastic selection of merchandise available from the blockbuster Harry Potter movies. Here, you will find all you need to transform yourself from an everyday muggle into a master of magic and wizardry. Everything that you need to put together a Hogwarts school uniform is here, from neck-ties and scarves to jackets, robes , and even skirts, pants, and shirts. And if you want to be someone a little more well-known, we carry ensembles of several famous (and infamous) professors. It all makes for great costume wear, whether its for a social occasion or for a themed event. Each item is based on the authentic pieces used during the course of the movies. Based on the original books by author J. K. Rowling, these movies and books center on a young wizard, Harry Potter, who, while new to both magic and to Hogwarts, the school for witches and wizards, is destined to save the world from the greatest magical threat it has ever known. Nothing short of a world-wide phenomenon, Harry Potter has swept millions up into its gripping story, spanning seven books till the storys end and having spawned eight movies based off of the fantastic plot laid down by the original seven books. So if you are a fan, here is your opportunity to pick up some great costumes and gear that will make you the envy of all your muggle friends! Want to wear something magical without having to wear a full set of dress robes? Check out our Harry Potter apparel section to find everything you need for your wizarding wardrobe. 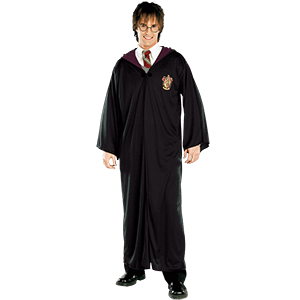 We carry an assortment of licensed Harry Potter clothing perfect for casual wear here. 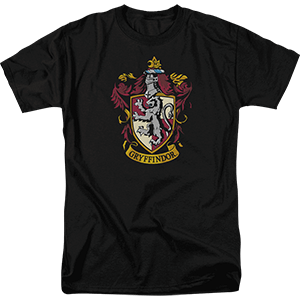 Shop Harry Potter t-shirts and Hogwarts house shirts that will help you show off your status as a Gryffindor, Hufflepuff, Ravenclaw, Slytherin, or even Muggle pride. Check out Harry Potter graphic t-shirts, featuring images of your favorite characters and the iconic Deathly Hallows symbol, alongside Harry Potter hoodies. 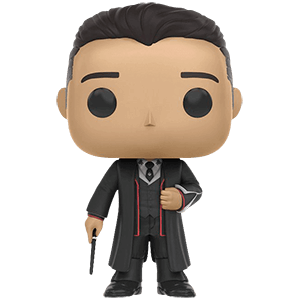 Here you will also find an assortment of clothing from Fantastic Beasts and Where to Find Them, including Newt Scamander t-shirts and No-Maj graphic tees. Then kick back with comfy Hogwarts house loungewear robes! Seeking a magical gift for your favorite wizard or witch? Or perhaps you want to treat yourself to something from the realms of your favorite fantasy universe. 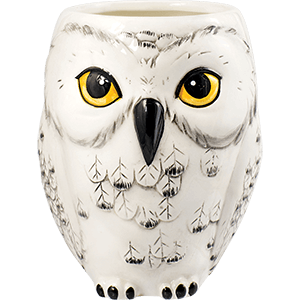 Whatever the case may be, be sure to check out our selection of Harry Potter giftware here. From Funko POP keychains to Hogwarts stationary and more, you will find it in this category. Check out Deathly Hallows keychains and journals as well as golden snitch gear, Fantastic Beasts playing cards, Hogwarts travel journals, and even Harry Potter wallets and purses here. When it comes to bringing a hint of magic to your everyday life, you cannot go wrong with our cauldron mugs. And our Hogwarts house keychains and journals are ideal for showing off your house pride, whether you count yourself as a Gryffindor, Slytherin, Hufflepuff, or Ravenclaw. Some say the wand makes the wizard, but the right accessories can work wonders, too! That is where our selection of Harry Potter hats, scarves, and ties comes in. Whether you are looking for the right Harry Potter neck-tie to show off your Hogwarts house colors with pride or a cozy Quidditch scarf to bundle up in while watching the next match, we have what you need to top off the outfits of wizard, witch, and muggle alike. 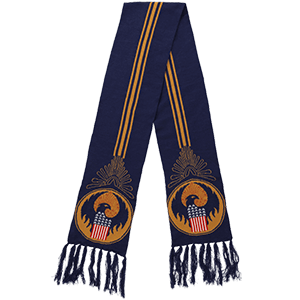 Shop here for Hogwarts house scarfs as well as Harry Potter fashion scarves great for casual displays of this magical fandom. Hats are also included in this section, including Hogwarts house beanies for chillier weather and Hogwarts headbands ideal for wearing a bit of your favorite wizarding school with any outfit. We also carry a selection of items from Fantastic Beasts and Where to Find them, including Newt Scamanders Hufflepuff Scarf. Browse through this section to see all the different Harry Potter hats, scarves, and ties we have to offer. Looking for a magical way to accent your look? 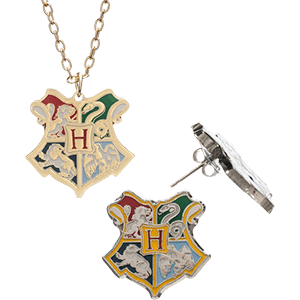 Check out our selection of Harry Potter jewelry! No need for Charms class when you wear our Harry Potter and Fantastic Beasts charm bracelets. Our selection of jewelry carries easy-to-wear pieces like Hogwarts earring studs, as well as statement-making wand necklaces featuring the wands of favorite characters from Fantastic Beasts and Where to Find Them. Shop Deathly Hallows jewelry here, MACUSA pendants, and even the locket of Tina Goldstein. Shop intriguing pieces like our Felix Felicis bottle necklace, quidditch snitch earrings, Hogwarts crest jewelry sets, and more.